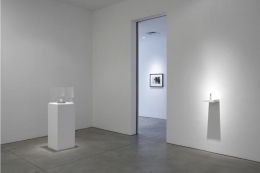 Sean Kelly Gallery is delighted to announce a major exhibition of new work by Gavin Turk, his first in New York since 2005. 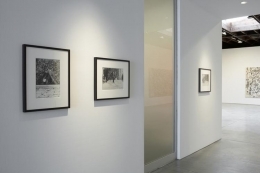 The exhibition is comprised of new paintings, photographs, sculpture and a video installation. The opening of the exhibition will take place on Thursday, March 26th from 6pm to 8pm. The artist will be present. 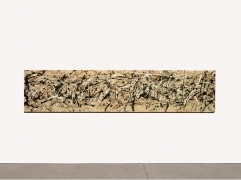 In the Main Gallery, a group of large-scale apparently abstract paintings, in the manner of Jackson Pollock, are in fact constructed from countless layers of paint representing Turk's repeated signature. 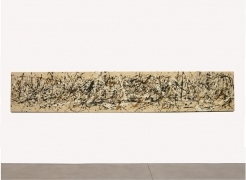 The works quite literally question the artist's signature as a sign of uniqueness and value. 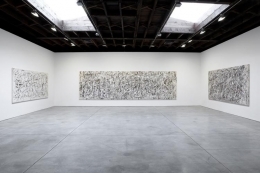 Turk's characteristic appropriation of identity in these paintings is echoed and reinforced by a group of black and white photographs of the artist in his studio making the paintings. 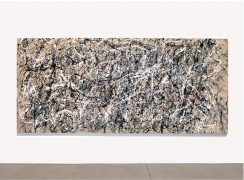 The photographs are reminiscent of the well-known series of photographs by Hans Namuth and Rudy Burckhardt that helped demystify Pollock's famous drip painting technique, revealing a deliberate process rather than a random splashing of paint. 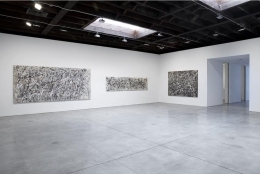 The paintings and photographs extend Turk's ongoing investigation into ideas of authorship and authenticity which have preoccupied him throughout his career. 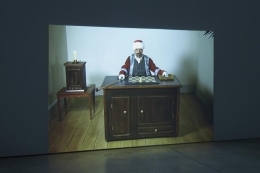 The Mechanical Turk, a film in which the artist presents himself as a life-size chess-playing automaton, will be projected in Gallery 1. 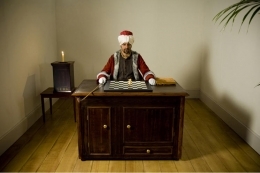 Turk examines the fascinating historical story of The Turk – a life-sized mechanized figure dressed in Turkish robes, which would trick viewers into believing it was a world-class chess player. This famous 18th century automaton astounded audiences across Europe and America and is said to have outwitted Napoleon. The setting and dress of the film exactly replicates 18th century etchings made of The Turk. The film, which is 14 minutes long, shows the artist dressed in costume, which was described as that of an "Oriental sorcerer," executing the knight's tour, a series of complicated chess moves whereby the knight is placed on an empty board, visiting each square only one time. 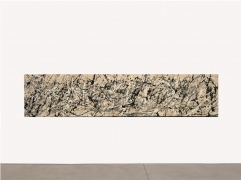 Turk consistently explores ways in which works of art are conferred with iconic status and value. He is interested in the way fame and celebrity affect the understanding of art and the position of artists. 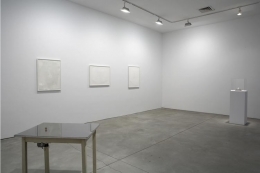 In the past he has utilized the personas and work of Joseph Beuys, Elvis Presley and Andy Warhol, to name a few. 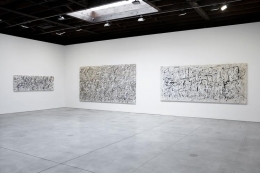 Turk borrows from the history of art and at the same time references contemporary popular culture, exploring the power of artists while questioning the uniqueness and inherent value structure of the creative process. 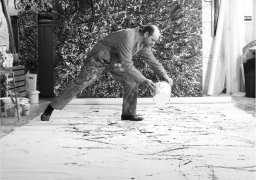 In the 1990s, Gavin Turk came to prominence as one of Britain's infamous "Young British Artists" and was included in the influential Sensation exhibition in 1997. 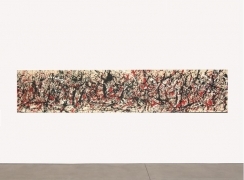 Turk's work is included in numerous collections such as The British Museum in London, The Victoria and Albert Museum, London, The Contemporary Arts Society, London, Deutsche Bank, The American Federation of the Arts, New York, The San Francisco Museum of Modern Art, and the Denver Art Museum among others. 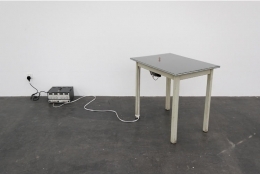 Forthcoming exhibitions include a mid-career survey at the Centre de Arte Contemporáneo in Malaga and a solo exhibition at the Yvon Lambert Foundation in France. Turk's work will be included in the exhibition Inventing Marcel Duchamp: The Dynamics of Portraiture, at the National Portrait Gallery in Washington DC, March 27 – August 2, 2009.